Precious metals posted gains on Monday ranging from 0.6% for silver to 1.6% for palladium. Gold’s close was its best in eleven week. Gold for December delivery rose $8.30, or 0.7%, to settle at $1,230.30 an ounce on the Comex division of the New York Mercantile Exchange. The settlement is the highest since gold finished at $1,233.60 an ounce on July 31. "The yellow metal has risen as investors are seeking safety as global [equities] continue to drop," MarketWatch quoted Alfonso Esparza, senior market analyst at Oanda. "Geopolitics events have snowballed around the globe and traders have to value the possible impacts of a trade war between the U.S. and China, Brexit negotiations, monetary policy divergence between major central banks and a global growth slowdown." 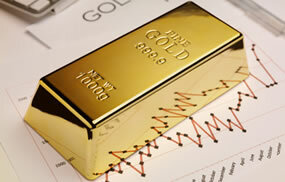 Gold futures ranged from a low of $1,220.40 to a high of $1,236.90. They gained 1.4% last week. Silver for December added 9.2 cents to end at $14.727 an ounce. The settlement is the strongest since silver closed at $14.774 an ounce on Aug. 28. Silver futures traded between $14.61 and $14.81. They edged 0.1% lower last week. January platinum advanced $6.30, or 0.8%, to $846.30 an ounce, ranging from $841.70 to $854.50. Palladium for December delivery gained $17.40 to $1,078.20 an ounce, trading between $1,059.60 to $1,083.60. The pair last week logged respective gains of 1.9% and 0.4%. Gold added $10.20, or 0.8%, to 1,229.95 an ounce. Silver added 14 cents, or 1%, to $14.74 an ounce. In LBMA results last week, prices for silver dipped 0.2% while those for others registered gains of 1.3% for gold, 1.7% for platinum, and 2.2% for palladium. United States Mint bullion products increased by 3,000 ounces in American Gold Eagles and by 200,000 ounces in American Silver Eagles.